A practical pump will never be able to convert all its kinetic energy to pressure energy. Parts of the energy will always be internal or external lost. 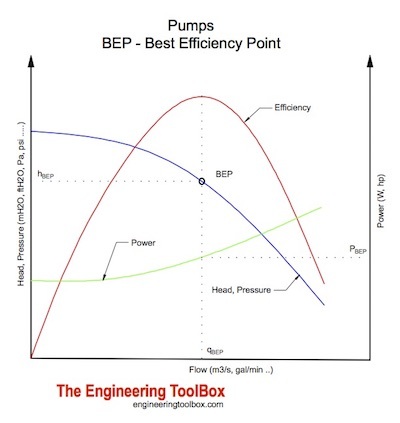 BEP - or the "Best Efficiency Point"
For pumps operating in all other positions - the efficiency will be less than in BEP. Engineering ToolBox, (2006). BEP - Best Efficiency Point - Pump. [online] Available at: https://www.engineeringtoolbox.com/best-efficiency-point-bep-d_311.html [Accessed Day Mo. Year].